You have to admit, once you look through the list of car races, cruises, shows, and events this weekend, you realize that Kansas City is a great place to be if you’re a fan. Heck, there is so much stuff this week, if I tried to hit everything my wife would stop talking to me. They’re having a big car show and cruise in Basehor that they’re trying to run like the Ol’ Marias River Run on Saturday, there’s a very popular Ford show at Gary Crossley Ford on Sunday, and a whole lot of other shows and cruises in between. The nostalgia run at KCIR on Saturday and Sunday sounds like a cool deal, but if you aren’t as turned on by shiny things, there’s a demolition derby on Heartland Park’s dirt track on Sunday. Whatever you’re into, there’s probably one of them listed for this weekend on the schedule below. And as always, remember to call ahead to make sure that the weather or some other issue hasn’t put the kibosh on your favorite event. Friday, May 13. Riverside, Mo. Riverside Red-X Cruise. 2401 NW Platte Rd, 64150-9627. 5:00 p.m.-8:00 p.m. For more information, visit http://www.riversideredx.com/events.html. Friday, May 13. Overland Park, Kan. Longbranch TGIF Cruise Night. Dan's Longbranch Steakhouse and Saloon, 9095 Metcalf, 66212. 6:00 p.m.-10:00 p.m. For more information, call Dan at (913) 642-9555. Friday, May 13. Basehor, Kan. Basehor Boys Cruise Night at the Sonic Drive-In. 155th and State Ave. US24/40, 6 Miles west of the Kansas Speedway/Legends. For more information, call Don at (913) 579-1669. Friday, May 13. Lone Jack, Mo. Sonic Cruise Night sponsored by Happy Days Dream Cars. Sonic Drive In, 101 Battlefield Road, 64070. 6:00 p.m.-9:00 p.m. For more information, call Chris at (816) 616-6612. Friday, May 13. Independence, Mo. HPAC East Cruise Night. Sonic Drive-In. 4001 Jackson Dr, 64057. 6:00 p.m.-9:00 p.m. For more information, e-mail hpacmopar@hotmail.com. Saturday, May 14. Basehor, Kan. Basehor Boys Ice Breaker - Park in the Park Show and Shine/Three Mile Cruise. 155th St and Leavenworth Rd, (2 blocks west- 6 miles W of Kansas Speedway). Show starts at 6:00 a.m. Three-mile cruise is at 4:00 p.m. For more information, call Don (913) 579-1669. Saturday, May 14. Peculiar, Mo. Pete and Jakes Hot Rod Parts Annual Open House, Car Show and Pinstripers Auction. 401 Legend Ln, 64078. For more information, visit the Facebook page. Saturday, May 14. North Kansas City, Mo. 2nd Saturdays NKC Car Cruise. 1900 Fayette Street. 3:00 p.m.-9:00 p.m. For more information, call Steve at (816) 412-7907, or e-mail sebeamer@nkc.org. Saturday, May 14. Lee's Summit, Mo. Dan's Cruise Night. Gibson's General Store, Highways 50 and 7. 5:00 p.m.-8:00 p.m. For more information, call (816) 524-2221 or (816) 524-2353. Saturday, May 14. Overland Park, Kan. Mustang Club of KC Cruise. Foster’s Grille. 11831 Metcalf, 66210. 6:00 p.m.-9:00 p.m. For more information, visit http://www.mustangclubofgreaterkc.com/CruiseNights.shtml, or www.facebook.com/MustangClubOfGreaterKC. Saturday, May 14. St. Joseph, Mo. Northwest Missouri Street Rods Cruise Night. Frederick Ave and Village Drive (Perkins--Exit 47). 5:00 p.m.-9:00 p.m. For more information, call Kat at (816) 233-0312 or Galen at (913) 365-4832. Saturday, May 14. Sugar Creek, Mo. Vintage Thunderbirds of KC Show. O’Reilly Auto Parts. 11218 East 24 Highway, 64054. 10:00 a.m. to 3:00 p.m. Open event for all Ford Thunderbirds. For more information, call Gerald at (816) 796-8815. Saturday, May 14. Olathe, Kan. Turn Styles Thrift Store Grand opening Car Show. 1703 Mur-Len. 10:00 a.m.-4:00 p.m. For more information, call (913) 909-2485, or visit http://kansascity.craigslist.org/eve/2356834708.html. Saturday, May 14. Kansas City, Mo. American Legion Post 61 3rd Annual Car and Bike Show. 5125 N Bellaire Ave, 64109. For more information, call Daniel at (816) 694-7448, or e-mail happyjackdan@gmail.com. Sunday, May 15. Kansas City, Mo. 30th Annual Mustang-Cobra-Ford Powered Car Show presented by the Mid-America Mustangers. Gary Crossley Ford. 8050 N Church Rd, 64158. 8:00 a.m. -3:00 p.m. For more information about the show, call Gary at (816) 524-7669, or Werner at (816) 810-9487. For registration information, call Linda at (816) 820-4717. See the event flyer here. Sunday, May 15. Hughesville, Mo. 2nd Annual Car and Truck Show. Pettis Co. R-5 P.T.O. Northwest High School. Registration is from 8:00 a.m.-noon. Judging is from noon-3:00 p.m. Awards and raffle at 4:00 p.m. For more information, call Agnes at (660) 631-5593, or Robie at (660) 851-0375, or e-mail robiemts@gmail.com. Friday, May 13. Kansas City, Kan. Weekly Racing. Lakeside Speedway, 5615 Wolcott Dr, 66109. For more information, call (913) 299-2040, or visit http://www.lakesidespeedway.net/. Friday, May 13. Kansas City, Mo. Friday Night Grudge. 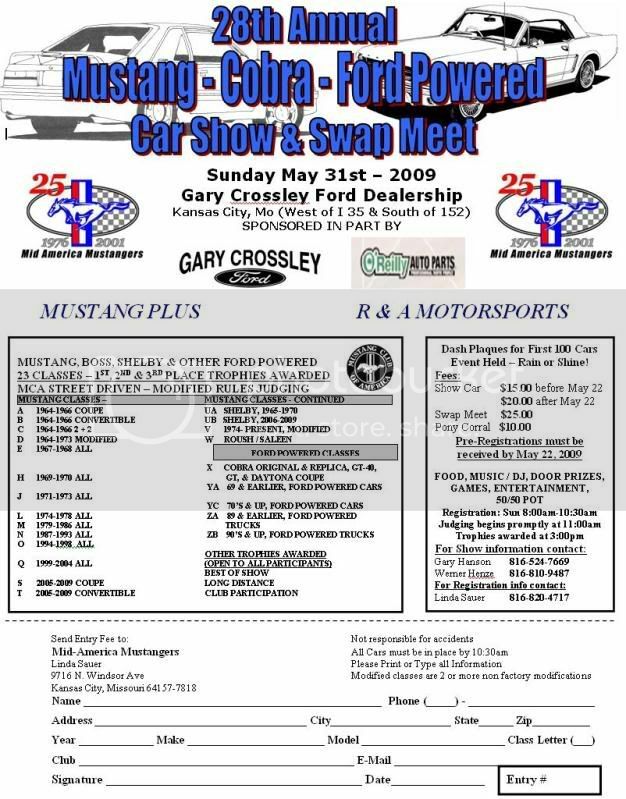 Kansas City International Raceway, 8201 S Noland Rd, 64138. For more information, call (816) 358-6700, or visit http://www.kcironline.com/. Friday, May 13. LaMonte, Mo. Weekly Racing. L A Raceway, 11649, 65337. For more information, call (660) 563-9878, or visit http://www.laraceway.com/. Friday, May 13-Saturday May 14. Grain Valley, Mo. Weekly Racing. Valley Speedway, 348 E Old 40 Hwy, 64029. For more information, call (816) 229-2222, or visit http://valleyspeedway.com/default.aspx. Saturday, May 14-Sunday, May 15. Kansas City, Mo. MidWest Nostalgia Run. Kansas City International Raceway, 8201 S Noland Rd, 64138. For more information, call (816) 358-6700, or visit http://www.kcironline.com/. Saturday, May 14. Nevada, Mo. Weekly Racing - Factory Stock Special. Nevada Speedway, S Barrett Ave, 64772. For more information, call (417) 667-5859, or visit http://www.nevadaspeedway.net/. Saturday, May 14. Topeka, Kan. Super Saturday Showdown - Dirt Track. Heartland Park Topeka, 7530 Topeka Blvd, 60610. For more information, call (785) 862-2016, or visit http://www.hpt.com/. Sunday, May 15. Topeka, Kan. Demolition Derby on the Dirt Track. Heartland Park Topeka, 7530 Topeka Blvd, 60610. For more information, call (785) 862-2016, or visit http://www.hpt.com/. There is a lot of great car stuff to do in Kansas City, but sometimes you need to step into the air conditioning and take a four-hour break. And that’s why they televise NASCAR races. Last week, Regan Smith pulled off an awesome Sprint Cup upset, while Kevin Harvick and Kyle Busch put on a spectacularly ridiculous display of temper tantrums (Harvick) mixed with spinelessness (Busch). And guess what—they’ll all be back again to do some more this week at Dover! For more information, visit http://www.nascar.com/. Friday, May 13. Dover, Del. NASCAR Camping World Truck Series Lucas Oil 200. 7:30 p.m. (C/T). SPEED TV. Saturday, May 14. Dover, Del. NASCAR Nationwide Series 5-Hour Energy 200. 1:00 p.m. (C/T). ESPN Television. Sunday, May 15. Dover, Del. NASCAR Sprint Cup Series FedEx 400 benefitting Autism Speaks. 12:00 noon, Fox Television. hi craig, just found your website via TKC. very cool. immediately added to my favorites. thanks for compiling all of this for us. i'm an uneducated doofus enthusiast, but the burble of a v-8, the aromas of leaded fuel and burnt rubber, and the rush of 0 to 60 in anything less than 10 seconds is a thrill to me. classic i would own if i could? 1966 Chevelle SS 396. Cool, man! Glad you found us! A '66 Chevelle SS sounds like a good choice to me! heh... me, too. red line tires of course.